There's nothing worse than powering through the last few reps, snagging your earbud, and being thrown to the mercy of techno-pop gym music blaring over the loudspeakers. A comfortable, sturdy, and convenient set of headphones is an important part of a workout for most people, especially those reliant on a specific playlist to get them in the zone. Whether you're interested in tracking your fitness levels, doing a marathon workout, or you want to have the best audio quality, there are several factors to consider when searching for a new set of headphones. Luckily, we've helped narrow down your search by compiling our list of the best headphones for working out. 1. Should I Be Moving Away From Wires? 2. Where Should I Buy Headphones? 3. What Should I Expect To Spend? How Did We Determine The Best Headphones For Working Out? To have a free-motion, active work out, a wireless pair of headphones is the recommended way to go. A corded set of headphones will certainly be cheap, but wireless headphones will eliminate the chance of your headphones getting painfully ripped out after catching on the bench for the tenth time. Like virtually everything these days, you can find the best headphones for working out on Amazon or any similar online retailer. Amazon will not only allow you to compare features, but it will show you price points, so you know that you're getting the best deal for your headphones. Another large perk of shopping on Amazon is that you can find a wide breadth of headphones, try them, and if they don't fit right or aren't exactly what you are looking for, you can return them. The quality headphones on this list range anywhere from $45 - $250. The best headphones for working out will include a wide variety of features without breaking the bank which is something you'll want to keep in mind when you come across a $200 pair of headphones. Make sure you're paying for the features and sound quality, and not just for the brand name. Each set of headphones on this list is both wireless and sweat-resistant headphones. The models range from wireless buds, in-ear headphones with a neckband, coil, or behind-the-head wire tether, and a few other creative designs. We also weigh some of the most important benefits, such as: the ability of the headphones to stay in your ears throughout a variety of movements and workouts, how long the battery lasts, how long it takes the battery to charge, how functional the design is for several workouts, any fitness tracking, and reporting capabilities, and how much the cost is relative to all the included factors. The Jaybird X3 earbuds deliver a fantastic balance between design, audio performance, and multi-sport functionality. Functionality wise, they are helmet-compatible and made with a special coating that prevents sweat, rain, and any other substance from seeping into the earbuds. The earbuds come with an array of combinations to find a custom fit for your ears. They feature three control buttons and are compatible with smartwatches, smartphones, and Apple products. As far as sound quality, the X3s don't leave you wanting for much more. The music plays free from skips, the sound EQ is customizable, and they stayed put during your workout. At only $100, these headphones are a fantastic bargain because they offer everything you want in a nice pair of headphones, plus some bonus features, all while staying well below the upper end of the price spectrum. Similarly to the Jaybird X3, the wire-linked Powerbeats3 wireless earbuds are compact, durable, and crank out a quality sound. They boast a longer charge by two hours and allow you to get an hour’s worth of playtime in a 5-minute charge, which is a lifesaver if you're in a pinch. The earbuds themselves are supremely comfortable and sturdy, and the sound quality is excellent. There’s a great balance in mid and high ranges, but it can get a little distorted if you’re really cranking the volume. They can withstand essentially every movement and will stay inside your ears no matter how hard you are working out. Overall, these headphones stand toe-to-toe with the Jaybird X3s, and would even take the edge as far as features, but they are twice the price. These are affordable headphones are resistant to water & sweat and boast nine hours of use on a single charge. They also include a built-in mic and volume controls, which make it a lot easier to toggle between phone calls and listening to music. The strap of these earbuds wraps around your neck, so if you're doing any workouts that might interfere with the back of your neck, these may not be the best choice. While the nine-hour battery life is impressive, especially at the $60 price range, the sound quality needs improvement. These wireless Bose headphones offer advanced technology such as the ability to track your heart rate during workouts with a built-in heart rate sensor, StayHear+ Pulse tips, and Bose Connect app. They are also very secure during a workout. The only downside is they only hold a 5-hour charge, and it takes up to 20 minutes to charge them enough for a full workout. While the extra features here are great, and Bose's sound-quality performs as expected, the price tag seems rather high when you factor in the low battery life. 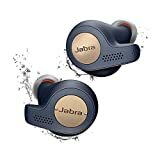 These wireless earbuds from Jabra also include a heart rate monitor that lets you track, analyze, and enhance your workouts with personalized real-time audio coaching. They perform an impressive array of other tasks like monitoring your fitness level, counting your reps, alerting you of over-training, and offering race pace predictions. 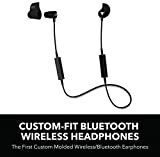 Aside from advanced technology, the earbuds sound great during your workout, with the only downfall being setting up the earphones to fit your actual ear. It may take a while to get them set up, but they are a good option if you're looking for more than just audio from your headphones. A single charge gives up to 7 hours of playback time. Use the hidden micro USB port to recharge like a pro. These headphones are connected by a soft, stretchy coil that goes behind your neck. The challenging aspect of the design with these headphones is that the control panel sits at the back of your neck, so switching songs or changing volume is difficult. They hold about 7 hours of battery per charge, and they are also reflective in case you like to get your workout in at night. The sound quality is decent but isn't an area of strength for the headphones. Overall, the negatives seem to outweigh the positives here, on what would otherwise be a great pair of headphones for $100. Behind-the-neck designStays put even during heavy exercise. Stereo Bluetooth 3.0-enabled with A2DP available For wireless connection and audio streaming. P2i coating Protects against damage from sweat and splashing water. The BackBeat FIT headset from Plantronics offers eight hours of sweat time on a single charge, slightly open ear tips for better ambient noise awareness, and voice alerts to let you know how much listening time you have before the device powers off. A 15-minute charge will power the wireless headset for an hour. The headphones rest on the back of your head, and the band connecting the headphones is waterproof and flexible. 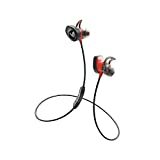 The sound quality is decent, and they are also durable throughout many kinds of workouts. While the technological focus is definitely a plus, the audio quality is not as good as many of the other headphones on this list. 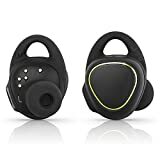 The Samsung Gear IconX headphones join the ranks of smart headphones that can track your activities, count calories, monitor your heart rate, and give feedback on your speed and distance traveled. You can monitor your metrics on the S Health app if you own a Samsung phone. If you don’t have a Samsung phone, however, you can connect via Bluetooth, but it only lets you listen to music this way, which definitely cuts into the benefits of these headphones. They feature 4GB of memory so you can download your favorite songs directly to the earbuds, but they only manage about three hours of battery life this way. The controls are difficult to master and can be a burden. You need to tap once to pause/play, twice to skip songs, and three times to go back to a previous track. JLab’s Epic Air wireless earbuds are fantastic earbuds for long workouts and marathon runners. They boast a seven-hour battery life but get a 30-hour lift in listening time from an included mini-charging case. They offer average sound, but overall the claim to fame here is that they can keep the party going for as long as you need them to. They offer 8mm drivers and Bluetooth 4.1 with aptX technology, which lets you stray up to thirty feet from your audio source. Unfortunately, there are many reviews that call out a sensitive touch control and a troublesome Bluetooth connection. These Decibullz headphones come with an interesting premise to get you a truly customized fit: you boil water, pop in the teardrop-shaped earpieces until they soften, put them into your ears, and then sit for five minutes to let the putty-like thermoplastic harden in your ear canal. While their appearance can be a little disconcerting, they offer a slew of high-tech features such as voice control and they feature a mic as phone control. So, what are the downsides? For starters, they only give you about three hours of battery life. That's among the lowest on the list. Not only that but as far as sound quality, for $100 you could find better-sounding headphones that fit into your ears just fine. 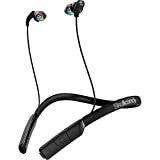 So, which are the best headphones for working out? Overall, based on all the different variables we've outlined, the winner seems to be the Jaybird X3. While Beats by Dre Powerbeats3 headphones come close to taking the title with a longer battery life, the Jaybird X3's are $100 less and feature the same quality sound that is ultimately the most important feature in any set of headphones. Hopefully, this list has helped you determine the best headphones for your individual workout. 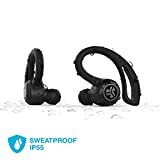 If you are looking for headphones that can also monitor your fitness levels and can track your motion, then there are alternatives on this list to consider, but if you already have an Apple Watch that can do that or those stats aren't as important to you, then the Jaybird X3 is your best sound, battery life, and technological capabilities for your dollar.